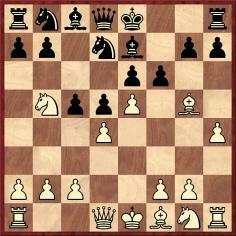 25 Bd3 Bxd3 26 cxd3 Rc1+ 27 Ke2 Rxh1 28 Rxa7 Ra1 29 Nb6 Ke6 30 Ra6 d4 31 Nc4+ Kd5 32 Ra5+ Ke6 33 g3 Bb8 34 a3 Rb1 35 Ra6+ Kf5 36 Rb6 Rxb6 37 Nxb6 Kg4 38 a4 Kf5 39 Kf3 h5 40 a5 Bc7 41 Nc4 Bb8 42 a6 Resigns. 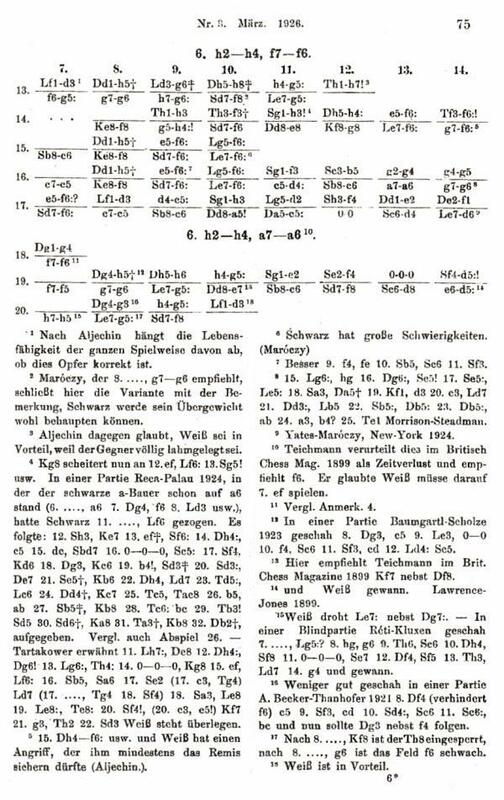 Source: with comments by Taubenhaus: La Stratégie, 20 June 1902, pages 182-183. A briefer set of notes by Taubenhaus was reproduced in Les Cahiers de L’Echiquier Français, issue 37 (September-October 1933), pages 152-153. Further to the consultation game given in C.N. 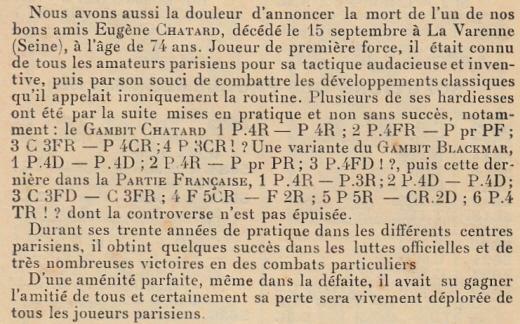 8554 which involved Eugène Chatard and began 1 e4 e6 2 d4 d5 3 Nc3 Nf6 4 Bg5 Be7 5 e5 Nfd7 6 h4, we offer some historical notes on this opening, which was first mentioned in C.N. 345. 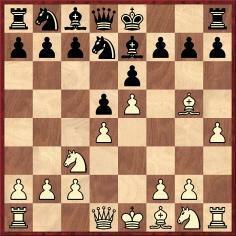 ‘This energetic move has been especially played in off-hand games by the ingenious Paris amateur, M. Eugène Chatard, and previously by the Viennese master, A. Albin. 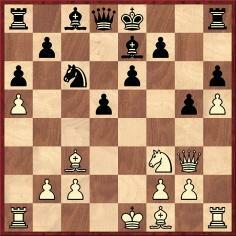 18...Bd6 19 Qg4 e5 20 Qa4 d4 21 Bd2 Bd7 22 Qb3 e4 23 Ng1 Qc7 24 Nh3 g4 25 Ng1 g3 26 f3 e3 27 Bxe3 dxe3 28 Qxe3+ Be6 29 Bc4 O-O-O 30 Bxe6+ fxe6 31 Ne2 Bb4+ 32 c3 Bxa5 33 Rh4 Bb6 34 Qxe6+ Kb8 35 Re4 Bf2+ 36 Kf1 Rd2 37 c4 Rhd8 38 Nc3 Nd4 39 b4 Nxe6 40 White resigns. In the game heading, and elsewhere in the magazine although not in the index, White was identified as ‘S. Bendiner’. The final words refer to a société parisienne established at the Hôtel Continental in 1913. It was the venue for the first match-game between Alekhine and Edward (then Eduard) Lasker on 6 September 1913; see La Stratégie, April 1913, page 149; September 1913, page 360; October 1913, pages 404-405. 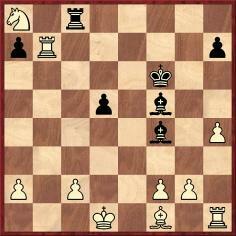 Between Albin’s use of 6 h4 in 1890 and the Alekhine v Fahrni game nearly a quarter of a century later, the move was seen occasionally. 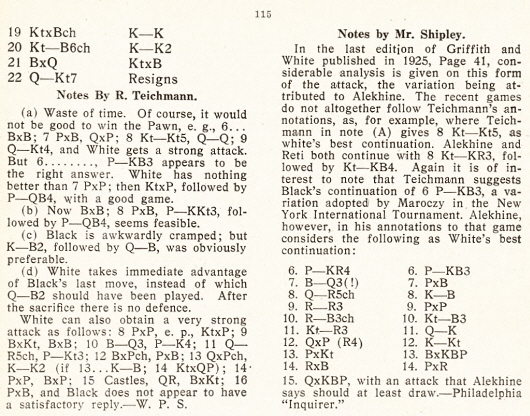 A game won by Mrs Fagan against Richmond, in the C division of the London Chess League Competition, was published on page 290 of the August 1897 BCM, White’s sixth move being described as ‘altogether unsound, but leads to a lively game’. 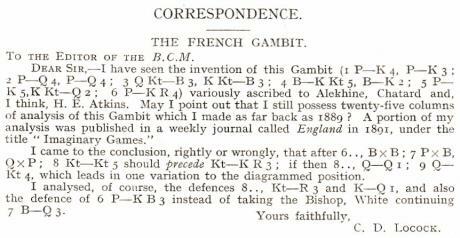 The June 1899 BCM, page 265 had a game between T.F. Lawrence and E.O. Jones, annotated by Richard Teichmann, with no occasion specified. (See the feature below written by Walter Penn Shipley.) Pages 222-223 of the May 1909 BCM gave the bare score of Lawrence’s draw with J.F. Barry in the Anglo-American Cable Match. 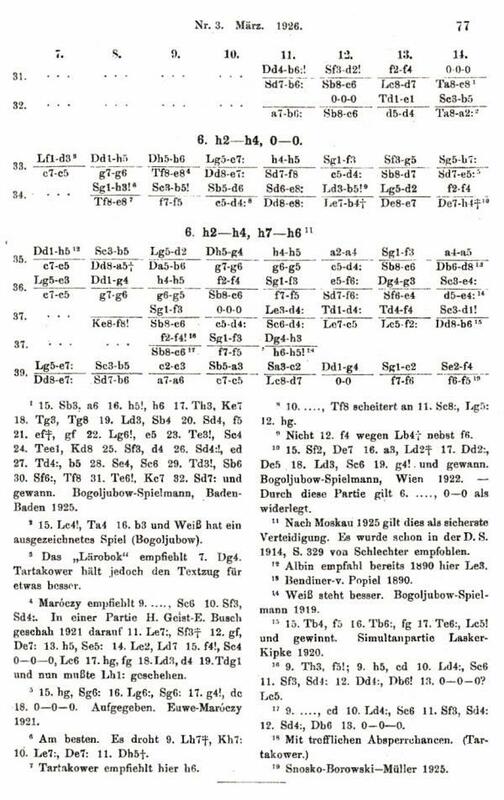 The following year Emanuel Lasker won a game in Buenos Aires against E. Zamudio; for the score, taken from page 78 of the Revista del Club Argentino de Ajedrez, 1910, see the 1976 and 1998 collections of Lasker’s games by K. Whyld. 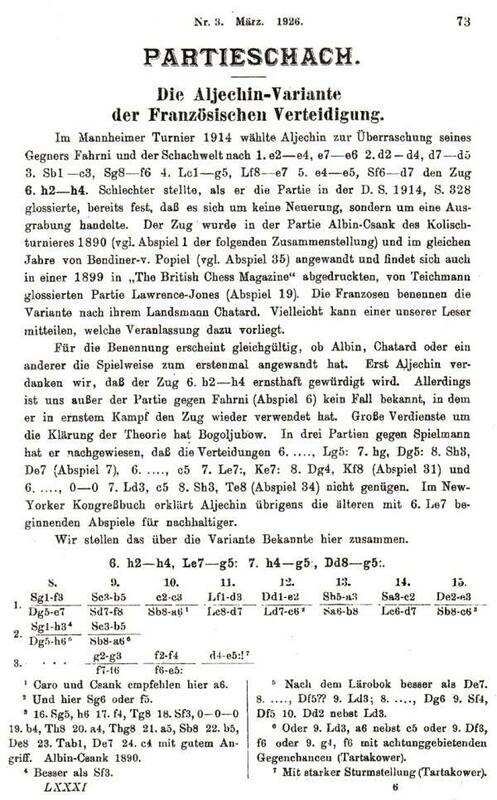 The German magazine’s analysis was summarized on pages 265-266 of La Stratégie, December 1926, but with a change of title: ‘De la Variante Chatard dans la Partie Française’. 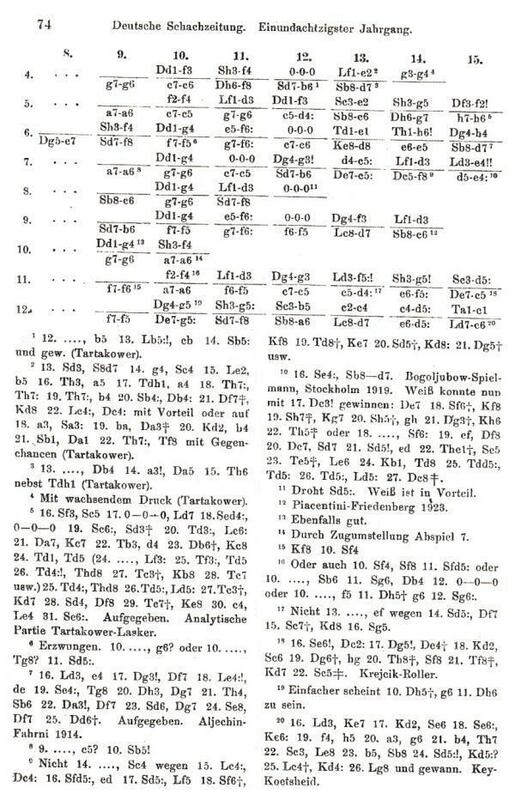 The opening also received attention in the Arbeiter-Schachzeitung, January 1928, pages 13-14 and 20-21. 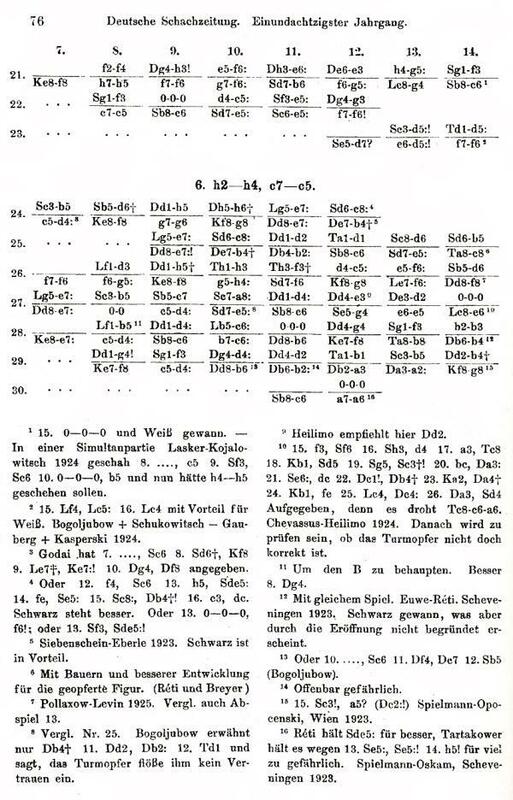 See too pages 330-332 of Tarrasch’s Schachzeitung, 1 August 1933 and pages 479-482 of the Social Chess Quarterly, January 1935. The latter item is an article on 6 h4 by Vera Menchik entitled ‘How to Meet an Attack’. Page 497 of the October 1937 BCM had a brief note on the ‘Albin-Chatard Attack’ by G. Levenfish, from Shakhmaty v SSSR. There was a detailed series of articles entitled ‘The Alekhine-Chatard Attack in the French Defense’ by S. Belavenets and M. Yudovich, translated from 64, in Chess Review, January 1938 (pages 20-21), February 1938 (pages 46-47), March 1938 (page 78) and August 1938 (pages 194-195). 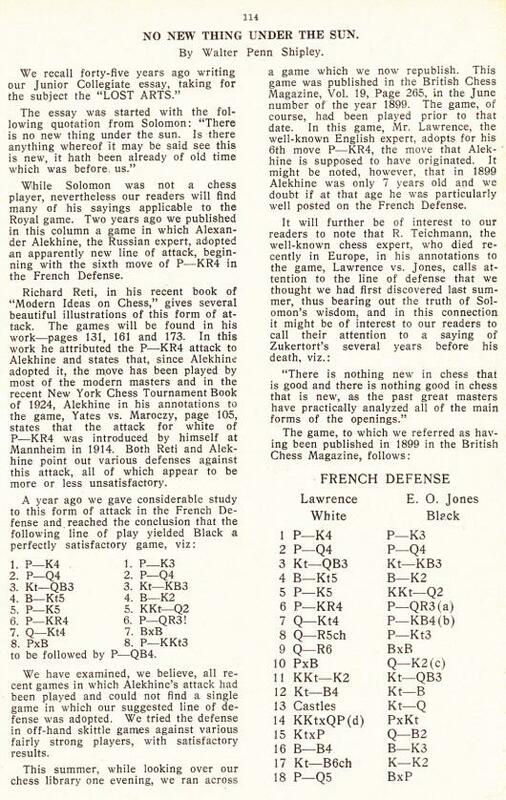 Pages 84-86 of the April 1939 Chess Review had further material on the opening, translated from Shakhmaty v SSSR and focussing on the reply 6...f6. See too ‘L’assault Chatard dans la Partie Française’ by S. Tartakower on pages 1643-1648 of L’Echiquier, 21 May 1932. Latest update: 18 January 2015.